This book is the English translation of a volume originally written in Hungarian and titled Egri Csillagok, i.e. "Stars of Eger." Historical fiction works best when the event it's built around requires no fictitious embellishment to fascinate the reader. Eclipse of the Crescent Moon takes place during the 1552 siege of Eger. During this siege, 2,000 Hungarians held off at least 40,000 Turkish invaders for over one month. The Turks retreated despite having had superior armaments as well as a massive numeric advantage. It's the perfect underdog story. Reading a purely historic account would be interesting enough, but Géza Gárdonyi creates value-added by imbuing his characters with depth, particularly his lead Gergely Bornemissza. There was much that was not known about Bornemissza. He was a minor character in history compared to Eger's commander, István Dobó. However, his expertise in explosives did play a role in this Hungarian success story. The book begins when Bornemissza is a young boy. He and a girl named Éva are captured by a Turk. The couple escapes and manages to free others. They later elope to avert arranged marriage. They have a child who is later captured by the same Turk who had captured them. A major subplot is a trip made to Istanbul to attempt to facilitate the escape of Bornemissza's foster father. 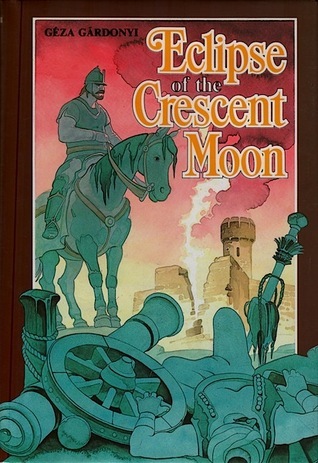 Sign into Goodreads to see if any of your friends have read Eclipse of the Crescent Moon.